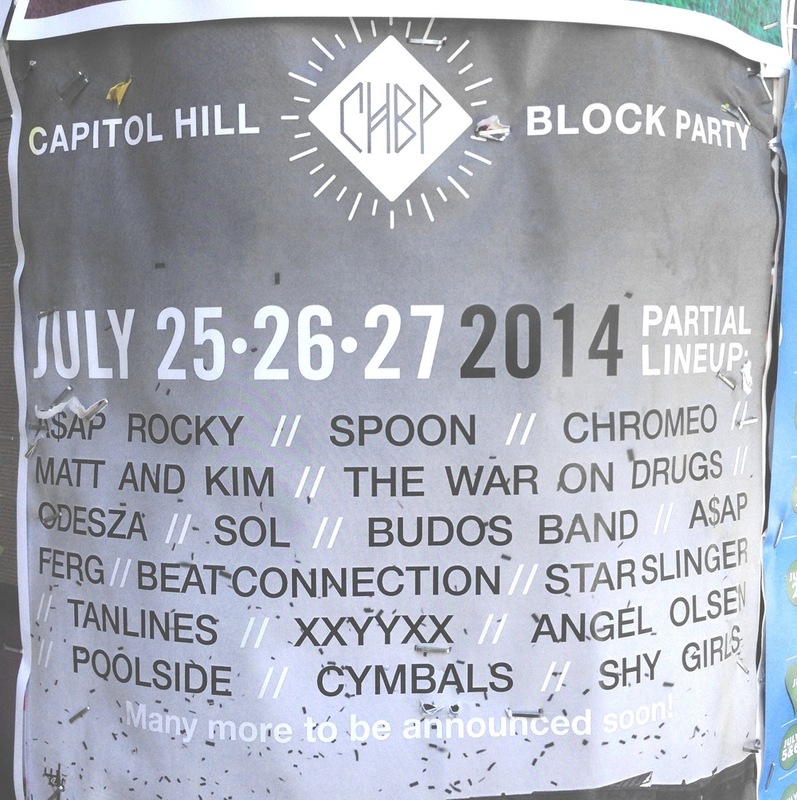 Capitol Hill Block Party is a summer music festival that takes place right in the heart of Capitol Hill. Lasting three days, July 25-27, the festival offers local artists as well as headliners such as A$AP Rocky and Spoon. The festival takes up about 4 blocks of Capitol Hill, shutting down the streets and setting up different stages. Shows go on where many SAAS kids would be getting lunch during school. Businesses like QFC, Marination Station and Ballet are all at the center of it. Some places even stay open during the July weekend. All kinds of people migrate to Capitol Hill for the atmosphere, music, food, and even people. The Capitol Hill Block Party website states that “if you're uptight about people that are different from you, you might want to go to the mall or something.” Most important, obviously, is the music. I’m going to preview a few of the artists from the lineup that I know and like. Hopefully, I am exposing you to music you haven’t heard before. If not, there are plenty of other artists going as well! Harlem-born A$AP Rocky raps with ease. His flow is what drives his lively music and what gives him an interesting stage presence. Collaborating with people like Clams Casino and Skrillex to make his beats, Rocky has both vocally and instrumentally diverse music. “Bass,” “Goldie,” “PMW (All I Really Need),” “Wassup,” and “Peso”are some of my favorite A$AP Rocky songs. If not for his music, you might just want to go to see what he will wear, as he is known to sport outfits from the latest trends in fashion. One of my favorite bands at the festival is sure to draw diehards from all around Washington. Spoon’s lead vocals are unique and engaging, coming from the voice of the talented Britt Daniels. The lyrics are smart and will quite easily find their way into your memory with enough listens. Personal favorites include: “Stay Don’t Go,” “You Got Yr. Cherry Bomb,” “I Turn My Camera On, Don’t You Evah,” and “I Summon You.”Spoon’s music is easy to get into, so don’t worry about not knowing all the lyrics now- but you probably will eventually. Chromeo is sure to put on a great show and give you the courage to actually dance. Chromeo uses synthesizers, deep bass, and catchy lyrics to produce electronic tracks that you would be foolish to miss live. Some of my favorite songs of theirs include: “Night By Night,” “Fancy Footwork,” “Come Alive, Hot Mess,” as well as the countless remixes of their hit “Jealous.”Whether you have listened to them before or not, Chromeo will be a fun show to go see with your friends or by yourself. Odesza is a pretty sweet way to end your July. Hailing from Seattle, Odesza recently sold out two shows at Neumos- a good sign that the electronic duo will be worth the price of a ticket. For starters, I recommend “How Did I Get Here,” “Sun Models, My Friends Never Die,” “If There’s Time,” and their remix of “Lost And Found,”by Pretty Lights. Odesza represents some of the best of Seattle-based talent, which is why you should definitely keep a lookout for what day their show falls on. Returning to Seattle after performing at Bumbershoot last year, Matt and Kim are energetic performers that can make you move just as much as bands like Chromeo. I think the general term “feel good” music applies to Matt and Kim, an element that is of course mixed with undertones of chaotic, teenage rebellion. To me, a few of their best tracks include: “Let’s Go,” “Cameras,” “It’s Alright, Block After Block, and Now.” I would see their show just because I have a strong feeling that its going to be sunny, and their music is perfect for a fine summer day. 18-year-old Marcel Everett makes incredible beats under his stage name “xxyyxx.” His music is chill, intricate, and sure to be interesting to see played live. Xxyyxx deserves to be listened to on nice headphones, or blasted from the speakers at Capitol Hill Block Party. My favorite tracks from xxyyxx are “About You,” “Fields,” “Breeze,” “Good Enough,” and “Closer.”Xxyyxx is set to release a new album soon, so his concert is bound to be filled with new tracks as well. It will definitely be worth it to go to see what he’s doing next. If none of these artists seem interesting to you, there’s a link to the full lineup below. Also, if you want to share your opinion of the lineup with the school, you can comment at the end of this article with your opinion. With the amount of artistic diversity and talent in SAAS, I’m sure that people will have their own favorite artists from the lineup- and will certainly have different opinions about the artists that I have previewed. Comment with a review of your favorite (or least favorite) artist from the lineup and encourage your peers to explore genres that they haven’t listened to before! Three-day passes have already gone on sale and one-day passes go on sale in June. Listen to some artists that sounds good to you, and help support local talent and business by giving the Capitol Hill Block Party a try this summer!